Decades ago I fell terribly and hopelessly in love with a young woman named Elaine. Any stranger on the street could see that we were doomed. I lived on the West Coast, she lived on the East Coast. She was smart and sophisticated and worldly. I, on the other hand, was a caricature of the socially retarded programmer. But I was possessed and she was, at the very least, optimistic and the fact that it was spring didn’t help matters. When I visited her in Massachusetts, she took me to breakfast at a local chain called Bickford’s and introduced me to their “Big Apple” Dutch apple pancake. I must have dragged her back there half a dozen times in the next week; it was so yummy! After I returned to work in California, she got a hold of the cook at Bickford’s and talked him out of the recipe for my favorite pancake so she could mail it to me. Perhaps the way to a man’s heart is though his stomach because I’ve made this recipe hundreds of times in the intervening years and every time I feel a flush of gratitude for that amazing woman and for her thoughtful gift. Peel and slice thinly the apples. Set aside. Mix sugar and cinnamon together. Set aside. Put butter into cast iron skillet and place it in the oven to melt. While it’s melting, mix flour, milk and eggs together to make a batter. Pour batter into skillet over melted butter. Arrange apples on top. Sprinkle with cinnamon and sugar mixture. Bake 20 minutes. Serve immediately from cast iron skillet. Serves 2. Thanks for the way to make this award-winning pancake. Restaurant is gone in Vernon, Conn.
Too bad are they allout of bussiness?? You’re lucky you got this when you did. The whole chain has become a terrible dive of over-processed, faux homemade crap. I, too, am a fan of the Big Apple! I visited the Nashua, NH location. I have since moved to GA, and upon my last visit to the live free or die state, found, sadly, that Bickfords there had also closed. Thank you Rick. I will be putting your recipe to the test this week! Your intro would make a terrific forward. Thanks for the recipe! When I was a little girl my grandparents used to take me to Bickfords for the “baby apple”. I haven’t had one in 20 years or so. I tried your recipe today and it brought me back to 1994. Delicious!!! Thank you so much for posting this. That’s awesome! You’re very welcome. OMG>>>> Just made it..Best thing ever,I also had a romance with a guy and this pancake (when there was one by my childhood home).They key here is the cast iron!!! !a Pie tin does not work well. Ha ha! Lovely! Thanks for your note. I woke up this morning and for some reason I thought of Bickford’s and this delicious recipe. I had to retire my old PC late last year and I had this post from you saved…but alas, I couldn’t make a clean transition to new PC…..I was so happy to find this same exact post/recipe again…..so many thanks to you! Thank you so much — I have been looking for this recipe for years! 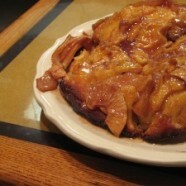 I’ve tried other Dutch and German apple pancake- but none can beat the BIG APPLE! I worked at the Bickford’s Pancake House in Peabody, MA when I was in high school; this apple pancake was by far the best seller; I have the actual Bickford’s recipe, but it makes a lot of pancakes, though it can be halved. I’m going to try this smaller recipe, thanks so much.